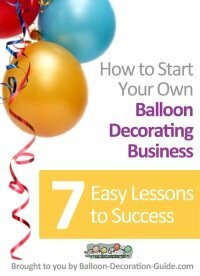 Blowing up balloons to exactly the same size is one of the secrets of professional looking balloon decorations. 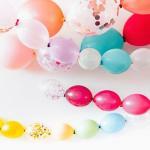 We recommend using a balloon sizer. This is usually a plastic box with circular cut outs which correspond to various balloon sizes. 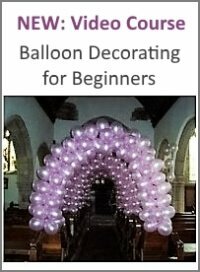 You can get a balloon sizer from balloon suppliers, or from Amazon (see the two examples below). 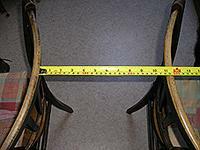 You can also easily and inexpensively make one yourself. Take a square cardboard box, and as in the photograph of the plastic balloon sizer, mark out circles according to the sizes of the balloons you are going to blow up. Then, using a craft knife, carefully cut out the center of the circles. Whether you buy one or make your own, the principle is the same. Blow up a balloon and pass it through the appropriate hole until it slightly touches the sides of the hole. For the balloon decorations we are going to show you, the main sizes for your DIY balloon sizer should be 5" (13 cm) and 11" (28 cm). 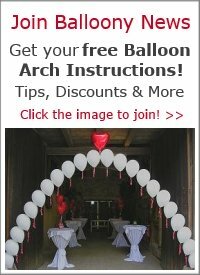 Another easy way to achieve balloons of the same size is to take two chairs and set them up back to back, so that the distance between them equals the size of the balloon you are inflating. 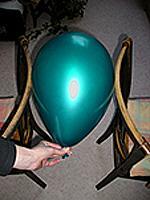 The inflated balloon should pass between the chairs just slightly touching either side.